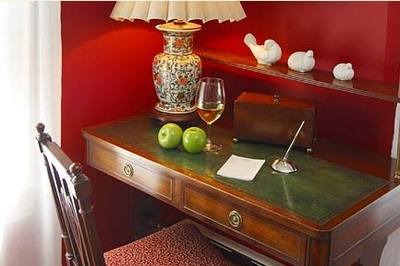 Beautiful, spacious corner room located on the second floor, is tastefully appointed with a queen four-poster mahogany bed, writing desk, antiques and a vibrant red and white color scheme. Five windows allow you to bask in afternoon sun while curled up reading a good book. 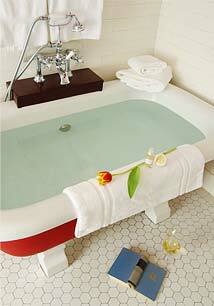 The bright and airy private bath offers an antique soaking tub and separate shower. Additional room features include wall-to-wall carpeting, cable television, and a gorgeous antique chest set at the foot of the bed.